I offer a space for you to explore your issues and experiences in a caring and supportive environment, to see things from new perspectives, to discover new meanings and build solutions to bring about positive change. I have helped those battling with low mood & anxiety to find new ways of managing, those experiencing loss to find meaning, those having relationship issues to gain new perspectives, those struggling with their careers to gain greater clarity & confidence, and those feeling isolated to reconnect with themselves & others. Outdoors session for a more dynamic counselling experience. A choice of locations are offered around the Farnham area depending on your preference. Goal-focussed coaching to support you to unlock your personal potential. I am a post-graduate educated, BACP qualified therapist with experience working in both general and youth counselling settings. My areas of specialist interest include anxiety, stress, loss, pain and life issues. I am also a member of Anxiety UK. I have experience working across a range of issues (both with young people and adults) including addiction, anxiety/stress, loss, family issues, depression, intimacy issues, self-esteem, loneliness, living with health issues, relationship issues and life changes. I have a broad background in mental health and have held a number of senior leadership roles in a variety of healthcare-focussed businesses. My background deeply informs my approach to therapy which draws upon humanistic, psychodynamic and solution-focussed modalities. 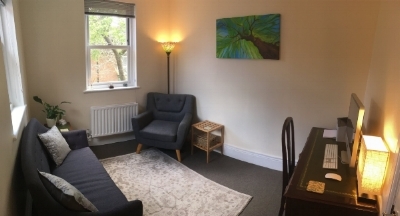 I work in a counselling room located in the centre of Farnham, offering both a comfort and convenience.